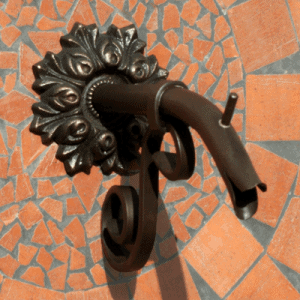 Inspired by fountains across Europe, the Bordeaux Spout features a small downturned spout mounted on a back plate decorated with a leaf and star motif. 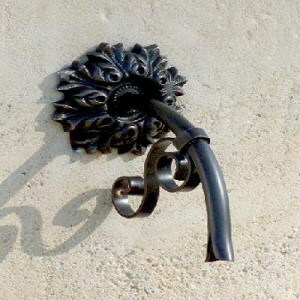 It’s crafted from a combination of 100% non-rusting copper and bronze. Unlike an iron spout which rusts and stains porous surfaces, the Bordeaux can be safely used in any architectural and/or outdoor living, pool, spa, and fountain design. It is a well-suited water feature for use with a wall bowl or basin with minimal forward water projection. 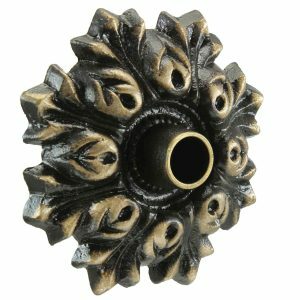 Available in a variety of finishes, the Bordeaux Spout looks especially striking in oil-rubbed bronze, antique brass or distressed copper. The price includes Dura coating.